Everyone does not have time to learn HTML for creating webpage but majority of us do crave to create online webpages with custom content. Online tool “Justpaste.it” makes this all easy. If you are not too concerned about look of a webpage and only want to publish webpage with specific content, then it cannot get easy than this. 1. 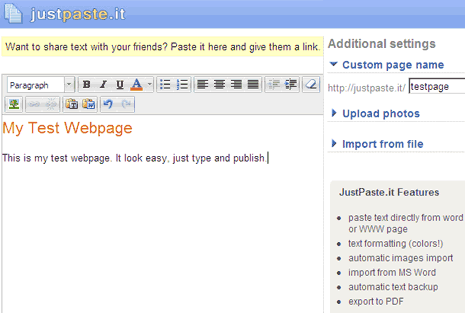 Open Justpaste.it website & type text in the online editor. 2. Format the color and font using controls on the text editor menu. 3. Enter the URL slug for the final access URL of your webpage. 4. You can upload photos, attach files and even paste text directly into editor. For sure one simple online tool for quick creation of webpage. This tool does not require any sign-up or registration. On published message screen, you also get unique URL to edit created webpage anytime. Once you have made webpage, pass the URL to friends for even quicker sharing.